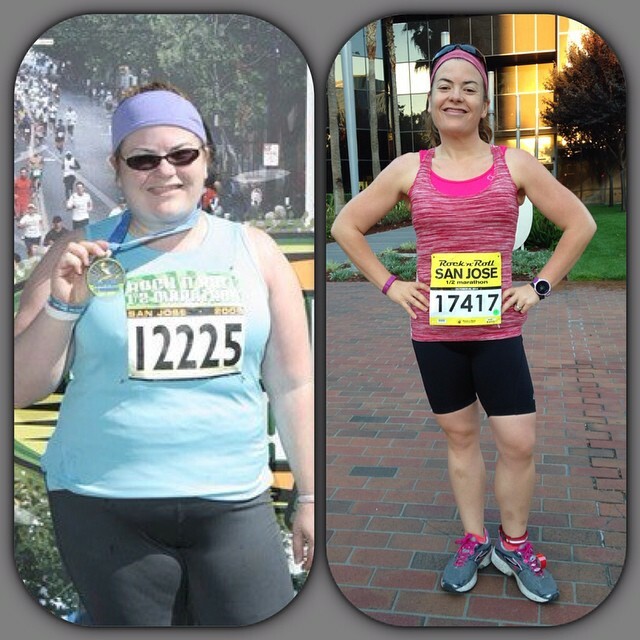 Now that you have had a chance to flashback with me to my first half marathon in 2009, let’s talk about taking this race back and owning it! Some races are about setting records. In 2009 I ran the #SJRnR half and finished the last three miles with ice Saran-wrapped to my back. Today isn’t about a PR (although that would be a nice bonus) — it’s about taking on a journey I started in 2009 and finishing it strong! Let’s be honest, I still wanted that PR! 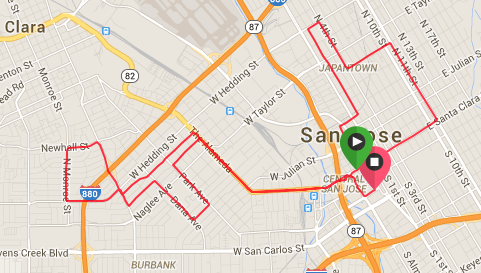 The San Jose Rock and Roll Half Marathon course is know as one of the flattest and fastest courses out there. And it was my hometown which meant I could fuel the way I needed and sleep in my own bed. In other words, it should be perfect conditions. What I didn’t anticipate was how hot it would get on race day. It was predicted to be unseasonably warm which meant extra hydration and the possibility of needing to slow down. When I originally signed up for the race I predicted my time to be 2:45. In September I had already proven I could run a sub-2:30, so when I went to the expo I requested a corral change. And on race morning, after spending some time with coworkers and some of my students, I went to my new corral. However, when I got in my corral, I apparently entered the one in front of my new corral by mistake. And I ended up directly behind the 2:15 pacers. I did some quick mental math. I had run a 10k at a pace that was almost a minute faster than the time I would need to hold for a 2:15 finish. Could I really keep the necessary pace to finish in 2:15? I knew I had issues holding a steady pace, going out too fast for many of my races this year. So maybe I would just *try* to stay with these pacers, no shame if I ended up falling behind. It would just be fun to see what it was like to run with a pace group for awhile! The two women pacing the 2:15 group were super nice. A number of people talked to them during the first couple miles but I held back, right behind them, not wanting to commit to getting to know them since I didn’t know how long I would be with them. However, as we passed the four mile mark, I began to realize I could stay with them. And after the 10k mark, I was embarrassed at the thought of falling behind. 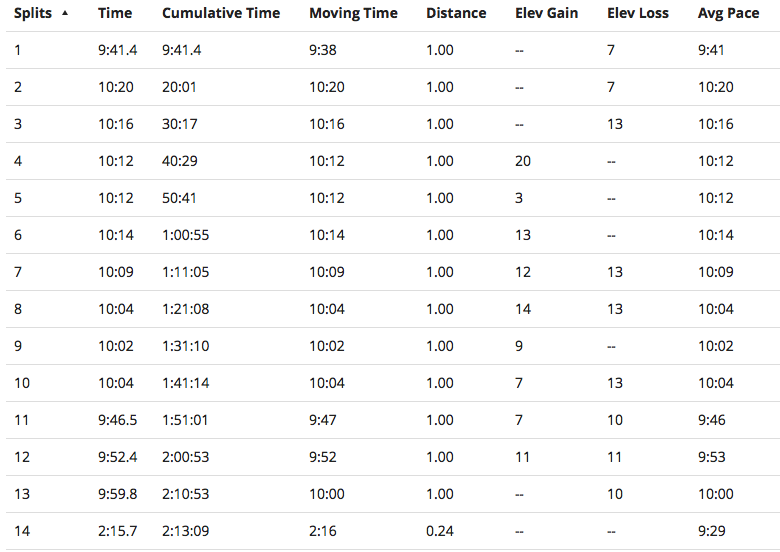 By mile 8, I really wanted to slow down. It was getting hot and I knew I could still PR even if I added a couple minutes to each remaining mile. But then I did a mental and physical check. It was all mental. Physically I was doing fine. And I took a moment to reframe — did I want to see what I could really accomplish? Or did I just want to shave a few seconds off my time. I began to reflect on my journey to get here. From 2009 when I initially attempted this race. To the 130 pounds I have shed over the past year. I have become so much stronger physically and mentally. I pushed through and when we hit mile 10, I knew I had more energy in the tank. So I pushed ahead of the lovely pacers who had prevented me from going out too fast and who served as a motivation not to slow down when I wanted to back off. I began to pick up my pace, not wanting to burn out but knowing I could go faster. Miles eleven and twelve were two of my fastest miles during the race! But it was getting hotter and I was feeling the burn. Mile 13 was hard. The quicker pace got my lungs a little cranky and mentally I was struggling as I remembered how much pain I was in during this mile in 2009. Then my trainer showed up alongside me! She was there running the 10k and stayed to run me (and her husband) in for the half finish. She started yelling motivational chants and telling me to kick it. I pushed so hard for that last tenth of a mile and finished smiling! I shaved over 13 minutes off my Disneyland Half! I left it all on the race course and took back the San Jose Half Marathon course. And now I am only imaging what else I can do! This entry was posted on November 6, 2014 by uncoveringfood. It was filed under Running and was tagged with #RnRSJ, 13.1, empowerment, half-marathon, race recap, reflection, running.